I paused while walking through Jiyugaoka recently to check out the offerings at this little sidewalk shrine to a pair of Jizo-samas. 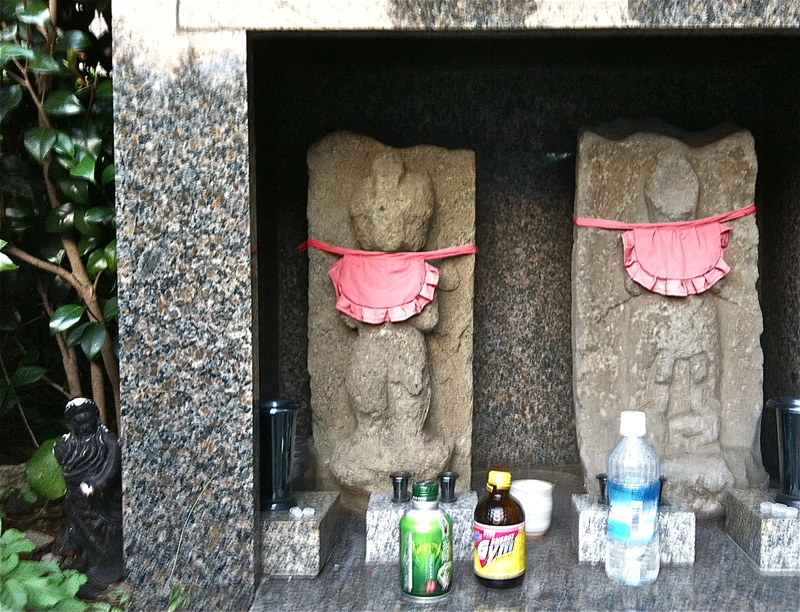 I understand how the gods might want a nice bottle of mineral water or green tea after all the saké festival-goers habitually urge on them, but does the bodhisattva of lost children and travelers really harbor a secret hankering for a big gulp of…Energy Gym? Then I noticed something even stranger. The Stalker. Look to the left of the little shrine hut and you’ll see the slightly shabby figure of what looks like one of the Chinese sages, lurking there in the bushes. He’s definitely got his eye on that sports drink.